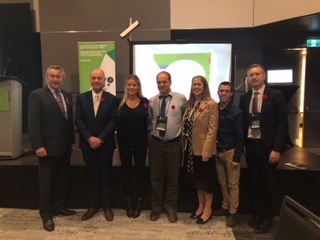 Ottawa, ON, November 6, 2018– Skills/Compétences Canada (SCC) is proud to launch its 14th National Skilled Trades and Technology Week (NSTTW), aimed at raising awareness to students and educators about the incredible skilled trade and technology career opportunities available across Canada. SCC, in partnership with the Nova Scotia Apprenticeship Agency, hosted the official launch of NSTTW on November 6 at the Halifax Convention Centre. Special guests included: Hugh MacKay, MLA for Chester-St. Margaret’s, on behalf of Labour and Advanced Education Minister Labi Kousoulis; HGTV’s Holmes Inspection, Holmes Makes it Right and Holmes: Next Generation Sherry Holmes; John Oates, President, Skills/Compétences Canada; Shaun Thorson, CEO of SCC; Marjorie Davison, CEO, Nova Scotia Apprenticeship Agency; Marina Turbide, silver medalist, Job Search, at the 2017 Skills Canada National Competition, and Ryan Leedham, silver medalist, Aircraft Maintenance, at the 2015 WorldSkills Competition. National Skilled Trades and Technology Week was officially launched with a virtual car painting challenge, where the teams competed in a relay. Leanne Jeffries, Director of the Skills Canada Collision Repair Program participated as a judge and commentator of this challenge. Skills/Compétences Canada also announced that the 25th Skills Canada National Competition will be hosted in Halifax on May 28 – 29, 2019, at the Halifax Exhibition Centre. Following the official launch, approximately 500 students from local high schools and post-secondary institutions participated in over 30 Try-A-Trade® and Technology activities held by educators and industry experts. These activities included aesthetics, electronics, virtual welding, autobody repair, precision machining, mechanical engineering CAD and many more. Throughout the day, students learned about the interesting and important educational pathways and career opportunities in several different trade and technology sectors. “With the significant evolution of technology and digital skills, tradespeople need to be proficient with the digital tools of trade. National Skilled Trades and Technology Week was created to raise awareness and create discussion about the important careers that are available to youth in the skilled trades and technologies and the skills needed to succeed”, said Shaun Thorson, Chief Executive Officer of Skills/Compétences Canada. During the week, SCC’s provincial/territorial member organizations across the country will host a series of events to promote skilled trade and technology activities in Canada. For more information, visit the NSTTW webpage on the SCC website. Also highlighted at the event was the importance of Continuous Learning, one of the nine Essential Skills identified as fundamental to working in the skilled trade and technology industries. According to the Advisory Council on Economic Growth, by 2030 the growing adoption of automation is projected to displace nearly a quarter of tasks performed by Canadian workers. While some of those most affected will be able to find alternative opportunities in the same or related field, we expect that 10% to 12% of the workforce will face job loss and struggle to find new positions unless they acquire new formal qualifications. For more information on the nine Essential Skills visit the Essential Skills webpage. Skills Canada was founded in 1989 as a national, not-for-profit organization with partner Skills Canada organizations in each of the provinces/territories that work with employers, educators, labour groups and governments to promote skilled trades and technology careers among Canadian youth. Its unique position among private and public sector partners enables it to work toward securing Canada’s future skilled labour needs while helping young people discover rewarding careers. Skills Canada offers experiential learning opportunities including skilled trades and technology competitions for hundreds of thousands of young Canadians through regional, provincial/territorial, national and international events, as well as skilled trades awareness programs. Headquartered in Ottawa, Ontario, Skills Canada is the Canadian Member organization of WorldSkills. For more information, visit www.skillscanada.com or call 877-754-5226. Media Contact: Michèle Rogerson, 613-266-4771, micheler@skillscanada.com.